If you want the easiest, most flexible golf league system available, this is it! We have been delivering superior quality golf software since 1988. That's 30+ years of service to golf groups. Your golf league is important to us! League Manager supports any type or size league. It pairs your golfers, builds the season schedule, calculates handicaps, points, standings, league results, and statistics. 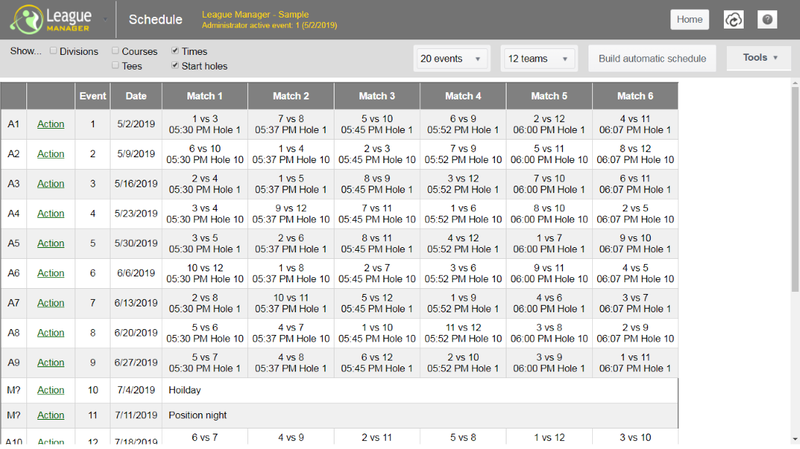 League Manager is extremely flexible - handicap and point calculation parameters can be customized to work the way your league plays. The website / app shows all your league's information, so league members can view league information at any time from any place. A league can have up to 9 divisions. A must for big leagues. Divisions can be "football" type divisions (inter-divisional play) or "baseball" type divisions (no inter-divisional play). Allows play from any number of courses and tees! Your league can play on any number of courses/tees in each event. A league can have any number of substitutes. Plus additional "ghost" substitutes can be used to handle any situation. League Manager is so flexible a golfer from one team can even substitute for a golfer on another team. Mixed (men/ladies) leagues are supported. League Manager automatically takes into account the difference in tees for handicap strokes. Option to track putts, greens, fairways, earnings, prize money, or ANY information your league needs to track. Set up your own handicapping system (any formula is possible), or use the USGA/RCGA style system. No need to change how your league handicaps golfers. 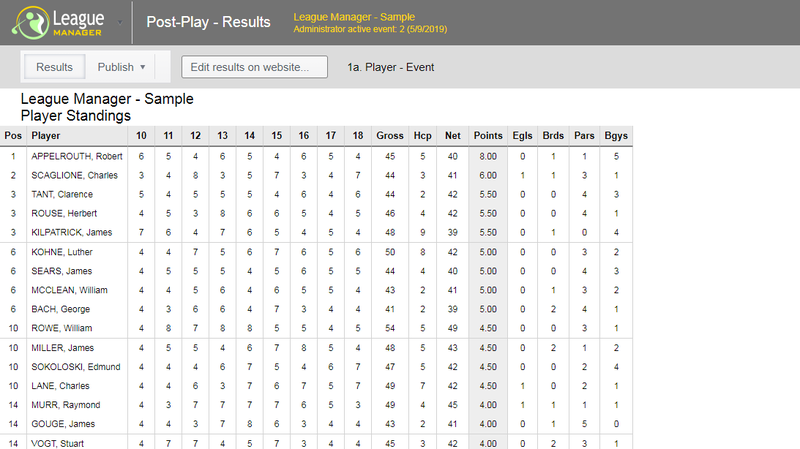 League Manager is flexible enough to calculate handicaps the way your league does now. Handicaps can be calculated to whole and decimal numbers. Option to "LOCK" a handicap. If for some reason you want a golfer to have a different handicap than the auto calculation would give him/her, you can type in any handicap and LOCK it for that event. Setup your own hole reduction system to calculate Adjusted Gross Scores. Set a maximum score allowed on par 3s, 4s and 5s. Or you can use the USGA Equitable Stroke Control, or no stroke control. 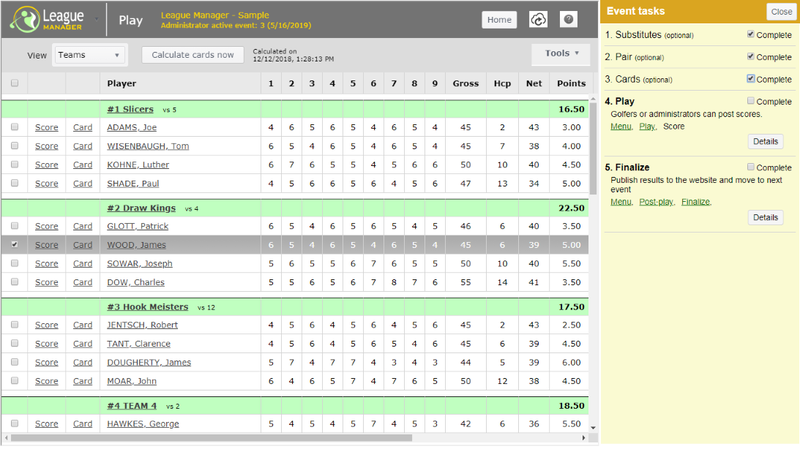 League Manager automatically calculates points, gross, net, adjusted gross, handicap, par, birdies, etc. Set up your own system for calculating points. 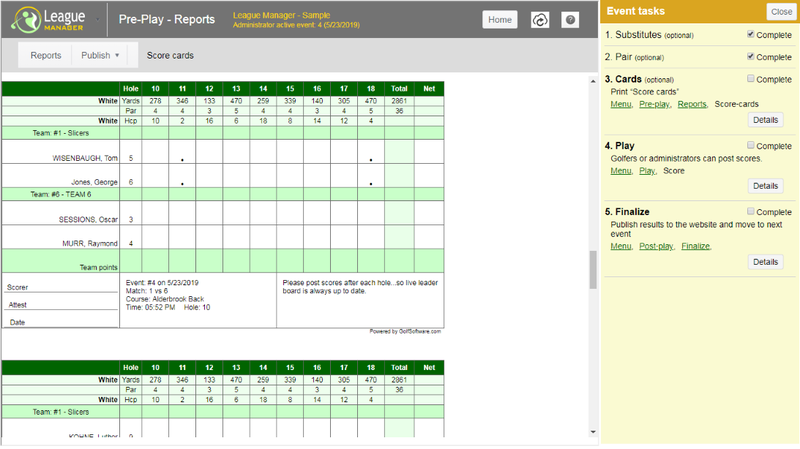 League Manager automatically awards points -- Hole-by-hole, Medal, Match, Best Ball, Stableford, Cross Match, Aggregate, Show up, etc. Any formula and combination of these is possible! Calculates total points, bogeys, pars, birdies, eagles, putts, low net, low gross, high points, best hole, skins, ringers, etc. Tracks totals, averages, lows and highs on any statistic you wish to track. Calculates total team points for the season. Breaks down regular, substitute, team, adjusted, and dropped points. Allows you to drop high or low score(s). Golfers may play: player versus player, team versus team, against the field, against the course, or any combination of these. Any points a substitute wins can be awarded to the sub him/herself, or the golfer he/she is subbing for. Option to override points. If you have a special circumstance where you need to alter the amount of points a golfer or team receives for a certain event, you can override the points awarded at any time. Automatically builds the season schedule. Pairs teams and golfers for each event. Option to customize league schedule. Options to manually pair teams and golfers. Also handles position nights, tournaments, rainouts, etc. The schedule sets the courses to be played for the entire season automatically. Option to manually set courses. Optional tee times or shot-gun start. Scheduling assures each team has a different tee-time or start hole each event. 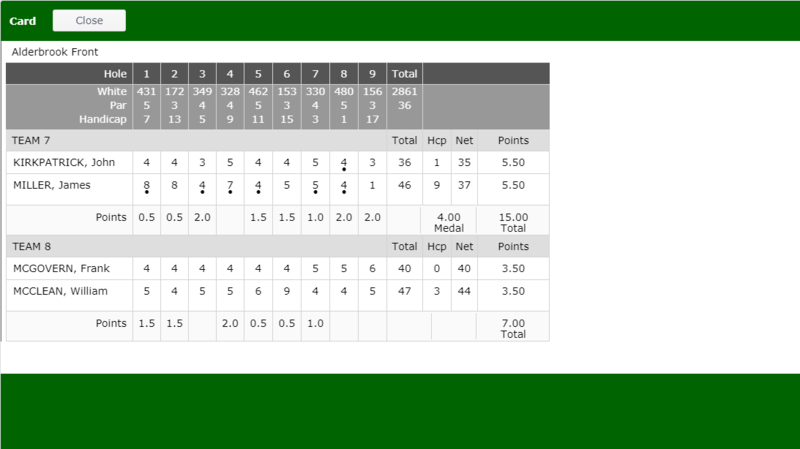 Option to display tee times/start holes on scorecards and other relevant reports. Course rotation option. For leagues that play front/back each week, scheduling gives best front/back rotation possible. Cross pairing option. 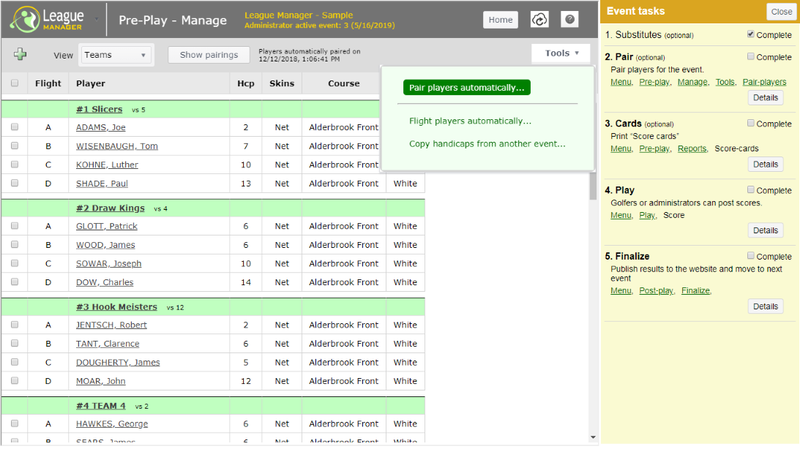 League Manager can automatically pair golfers across flights. For example, many leagues play A vs. A, B vs. B, etc. when two teams are matched to play. The second time the two teams are matched, League Manager can automatically pair the golfers A vs. B, B vs. A, etc. This works for 2 to 48 person teams. Pair opposing teams as twosomes, foursomes, sixsomes, or even eightsomes. 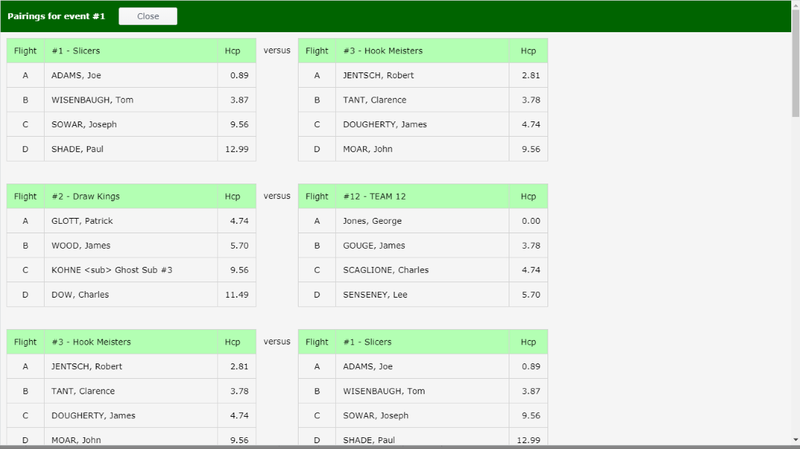 Automatically flights players by handicaps or points won. view any information you place on the league website. sign up for skins competitions. view and print out their score card. post scores for themselves, or any number of golfers in their playing group. see live leaderboards while they play from any computer or mobile device (phone, ipad, tablet, etc). view other golfer's contact information. make comments on the chat board. Reports and results are automatically posted to your league website. You can also print to paper if you wish. Many types of Roster reports, Individual reports, Team reports, and Statistic reports. Live Leaderboards - Golfers can view live leaderboards while they play on any phone, mobile device, or computer. Leaderboard automatically updates current results for gross, net, and points. 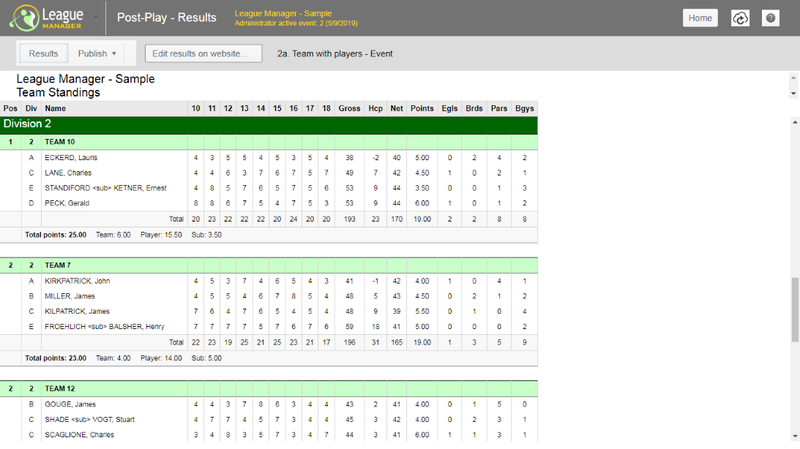 Score Cards - Creates a scorecard for each team or match. Shows course, team, and golfer information. Handicap and strokes are marked on each hole. Cards can be customized to show anything. Team Pairings - Matches competing teams and golfers. 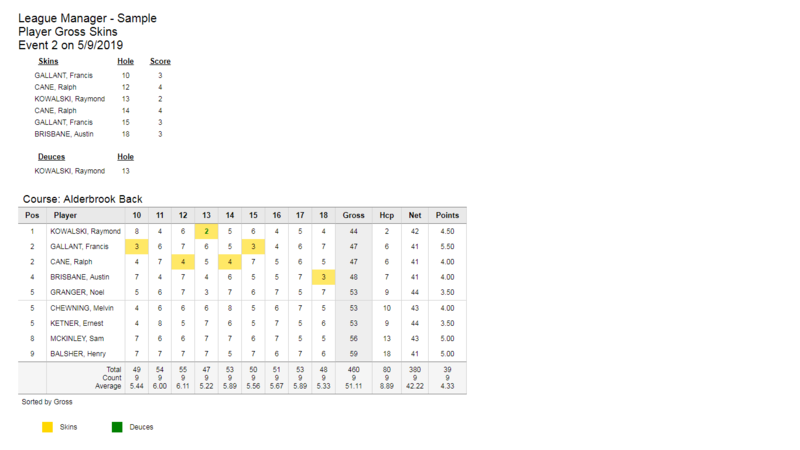 Event & Season Results - Team/golfer's scores, points, handicap, standings, and many more stats. Golfer's Rank/Honors - Best scores, points, pars, birdies, putts, etc. - for event, season, or average. Skins Report - Skins and deuces using gross or net scores. Individual and team skins available. Ringer Report - Takes the best score on each hole for the season and builds a golfer's best possible round. Golfers love this report, it makes them look like a pro. Both gross or net. Course Results - Interesting statistics about each course your league plays. Player Roster - League directory, checklist, directory with addresses. League Schedule - Team/golfer pairings for the season. Any results report can be flighted! Reports can be customized to show only the information you need. The layout of each report is controlled by you -- Margins, page length, page width, report header, report title, and more. Reports can be printed in any size font or style. Export into HTML file format. HTML is the universal format for viewing on the web, importing into Excel, or transferring reports and data from one program to another. "Internet Email" lets you email one, many, or all your golfers with just a few clicks. Templates. Internet Email automatically saves emails as templates for future use. No need to retype emails over and over again. Form Letter Emails. You can build form letter emails, which automatically fill in personal data for each golfer in the mass email. Friendly and easy-to-use. Just sign in and go! Ability to roll over golfers and scores from the previous season. Plus much more! If you don't think League Manager will award points or handicap the way your league does, give us a call at 919-460-7424. Free friendly coaching and customer support. 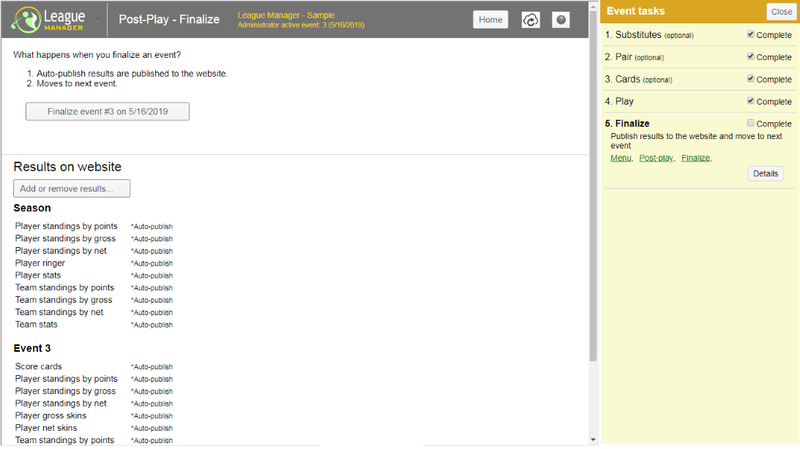 League Manager is easy to use, so most customers never require help. But if you need help or advice don't hesitate to call, email, or submit a help ticket. We are	here to help. You'll find this is the best League Manager out today. I guarantee it! Try it and compare it to the competition. I'm positive you'll be delighted.